Today is National Poetry Day, and I feel like I’ve been caught without my school project completed. I’m stalling in the hallway, scribbling out enough verbiage to meet the word count, hoping I don’t get asked to read it out loud. I got nothing prepared, folks. But as it happens, I visited Artprize in Grand Rapids yesterday and had an experience that I can connect to National Poetry Day, so here goes. 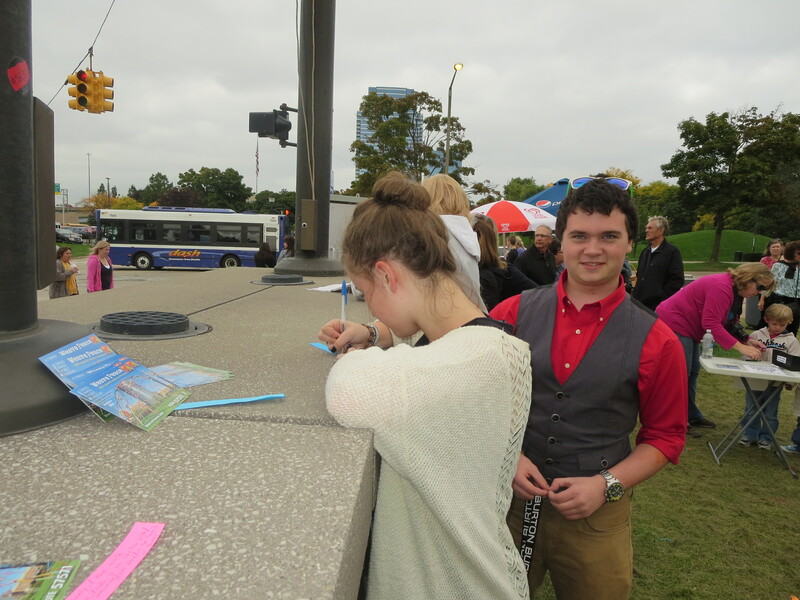 Artprize is an international competition, now in its sixth year, that brings art out into the community in a spirit I also try to embrace in this blog. The competition is open to anyone, and anyone can help with the judging. (The grand prize is $200,000, and visitors can vote as often as they like, but only once for each entry.) Entries are exhibited in coffee shops, abandoned buildings, banks, boutiques, public museums, and even in the river. 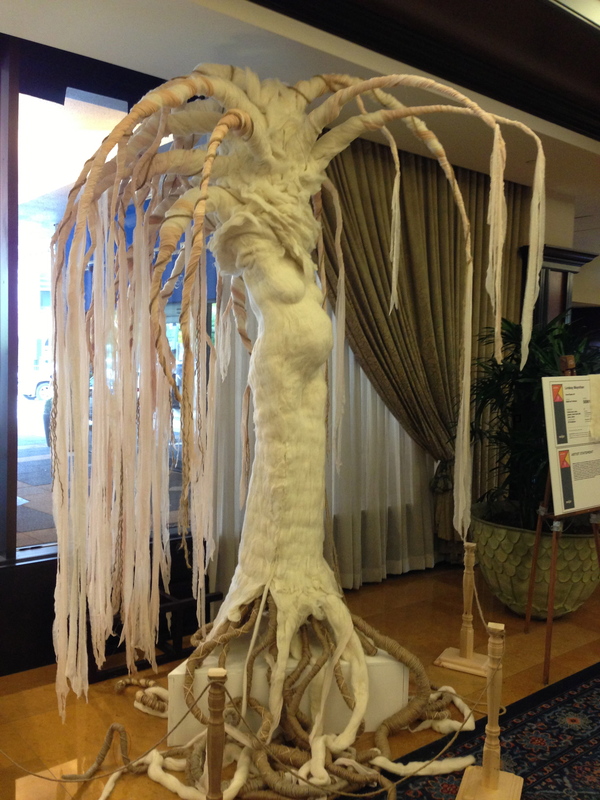 One of the entries was WeavePeace. 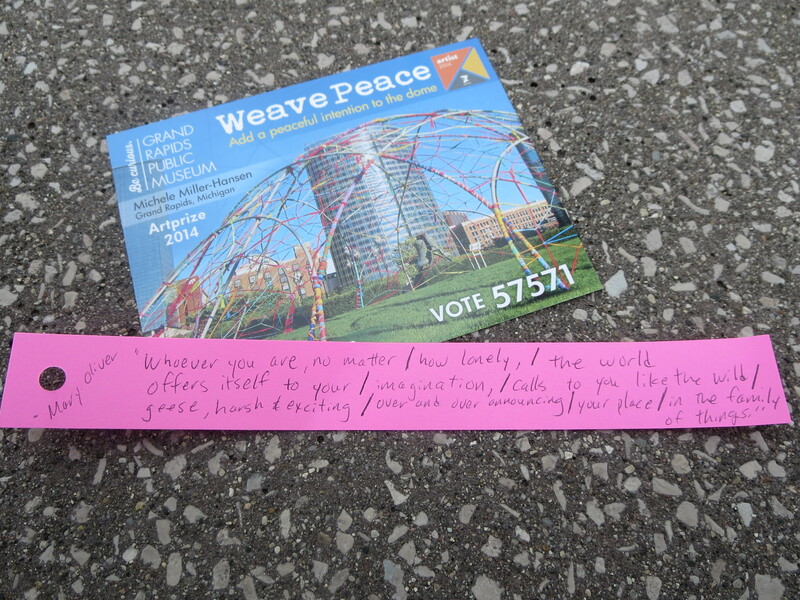 WeavePeace, an installation on the grounds of the Grand Rapids Public Museum, is a cooperative project between visitors and the artist, Michele Miller-Hansen. 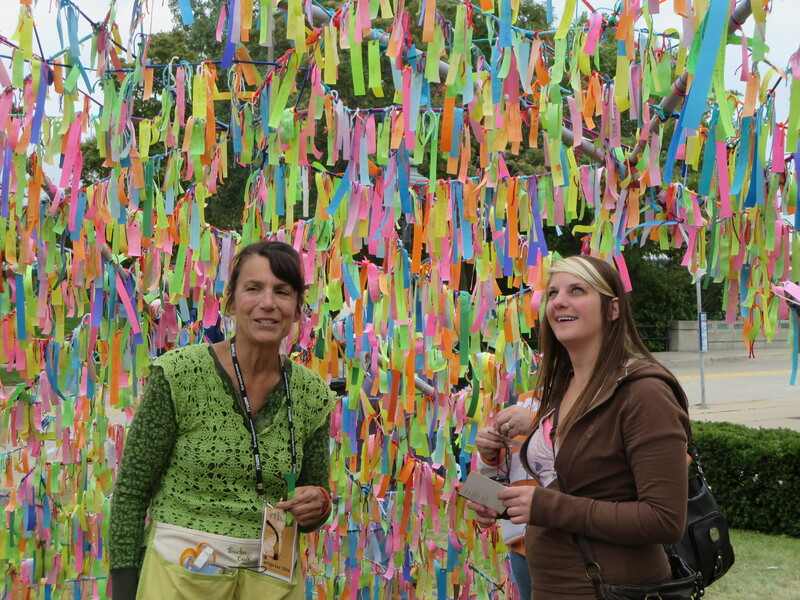 WeavePeace began as a bare structure, but in a week’s time has sprouted hundreds of strips of colorful messages. 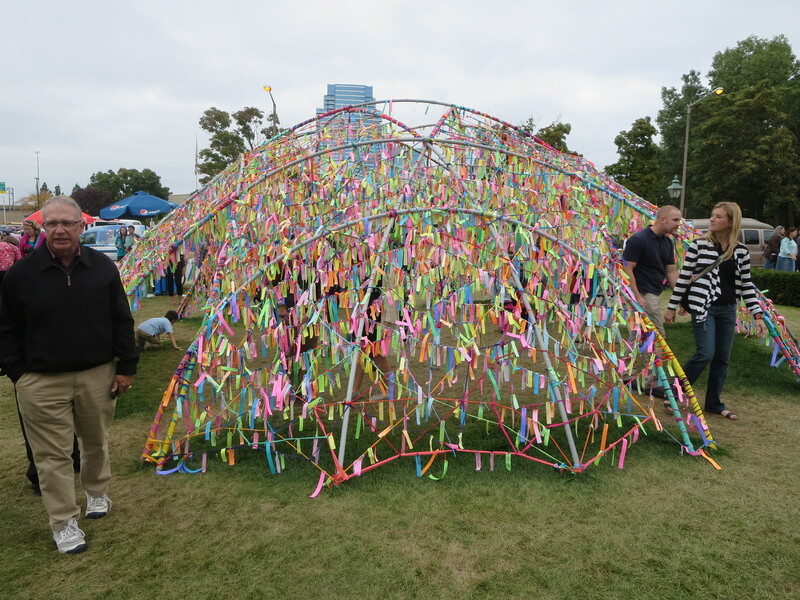 Artprize visitors write intentions and wishes for peace, and tie them to the dome. I spoke with the artist, who hangs around inside the dome for a few hours every day. She said she’s pleased that WeavePeace seems to make those who visit feel happy. “Our world is so busy,” she said, “and people come in here and they get to slow down.” People read strips other visitors have written, spend time thinking of what they’d like to write themselves, and enjoy the beauty of the strips fluttering in the wind. That sure sounds like the work of poetry to me. Poetry forces readers to slow down, reflect, connect, and appreciate beauty, if only the beauty of language and concision. 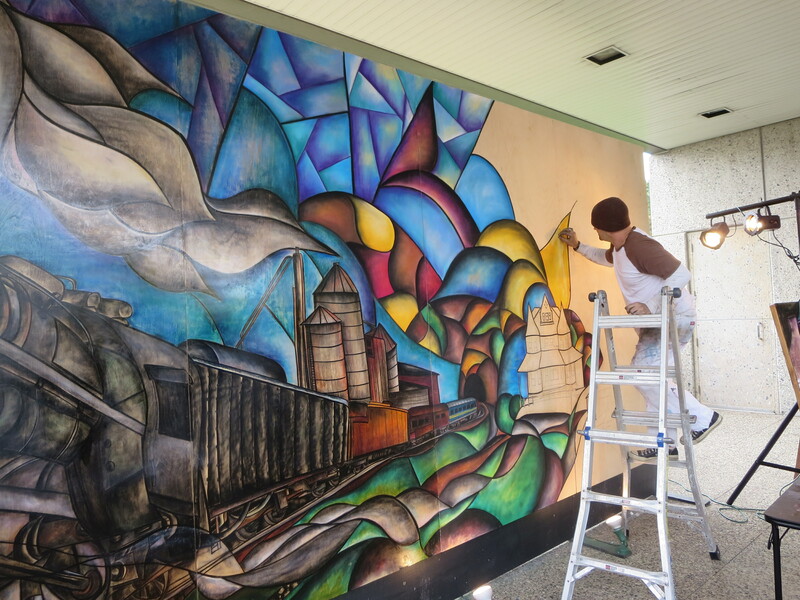 Good luck to artist Michele Miller-Hansen! I took a few photos of other entries. This one you have to experience. I can’t tell you how beautiful it is when you find yourself covered in lacy shadows. 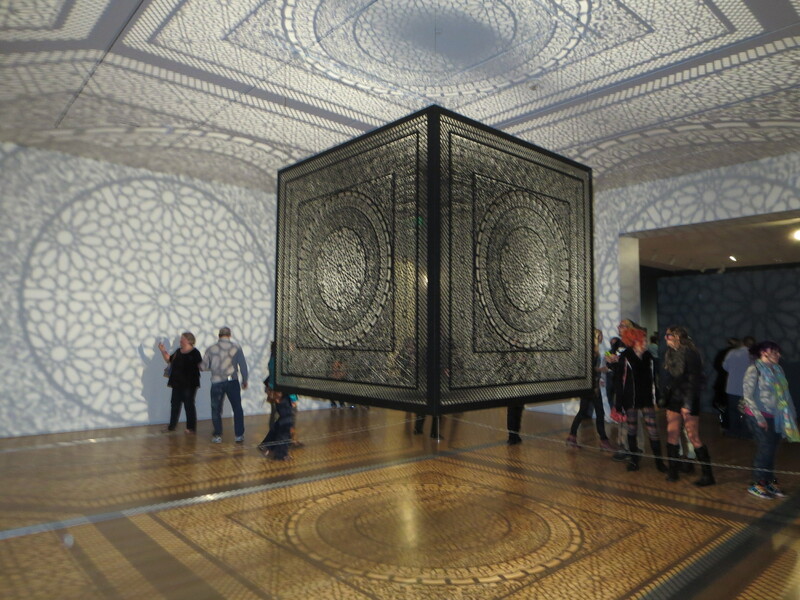 “Intersections” by Anila Quayyum Agha at the Grand Rapids Art Museum. 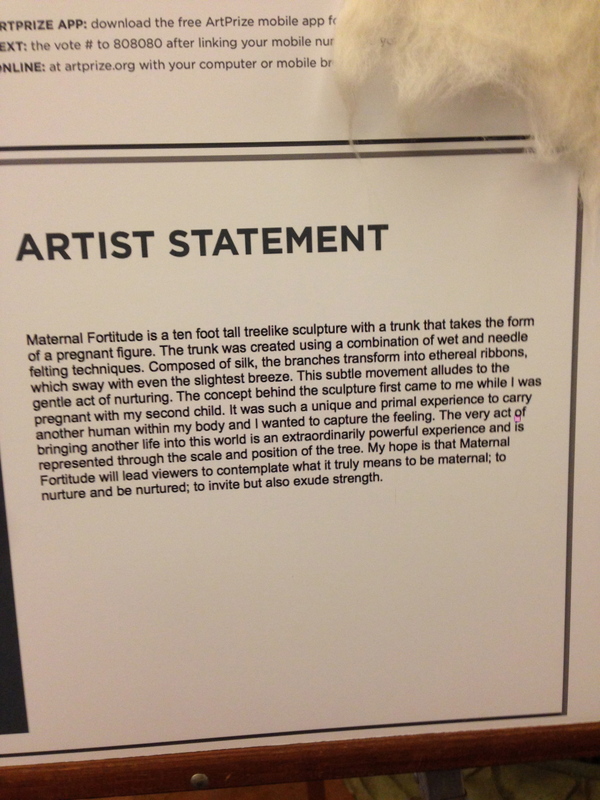 My favorite, “Maternal Fortitude” by Lindsay Moynihan, is at the Amway Grand Plaza Hotel. 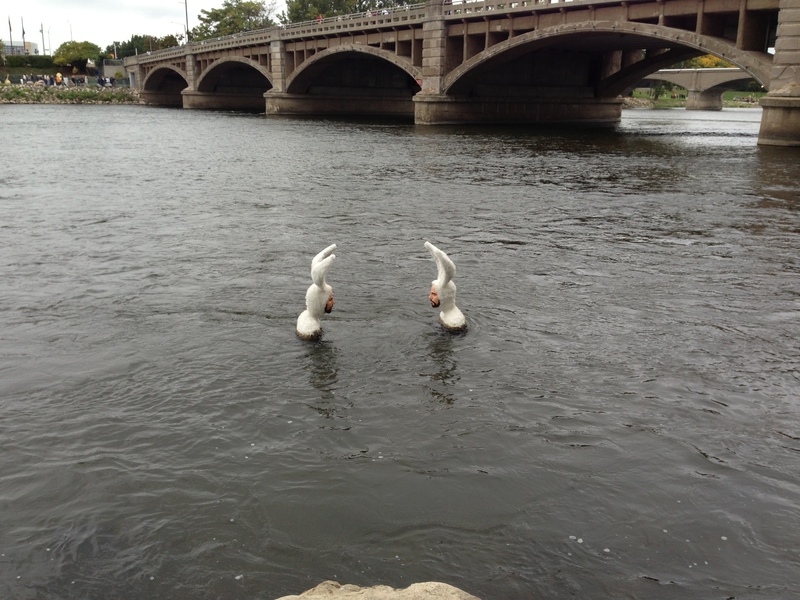 Artprize runs through October 12. Visit if you can.